In our last post, we saw the different types of cutters used by various ancient gunsmiths on their rifling machines. In today's post, we will look at a couple of other parts of the ancient rifling machine that gunsmiths from centuries ago would have used as well. The first part we will look at is the barrel clamp. Briefly, barrel clamps are used to hold a barrel while the rifling is being cut on the inside of it. We will look at a common design that was used for this purpose. A typical ancient rifling machine would have had at least two or more clamps of this type to hold down the barrel. 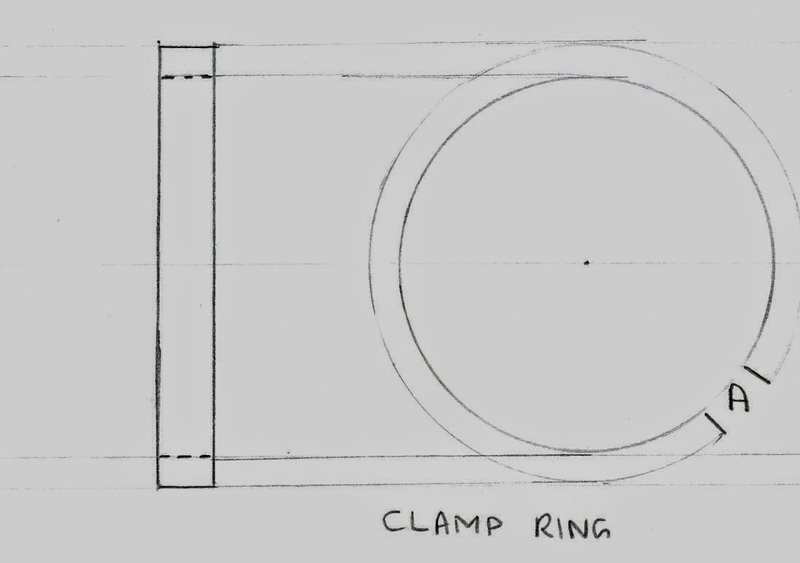 The clamp ring's inner diameter is slightly larger than that of the barrel it is expected to hold. The ring does not form a complete circle, but has a small gap at A.
Click on image to enlarge. Not to scale. Public domain image. Basically, these are just flat pieces of metal with holes punched in the middle. Each barrel clamp requires two of these. In addition to these parts, the gunsmith would have built a small bolt to hold the flanges together and a larger bolt to hold the entire clamp. This would have required skills in cutting screw threads and making nuts and bolts, but these were technologies that were already mastered for hundreds of years. Click on image to enlarge. Not to scale. Author places image in the public domain. 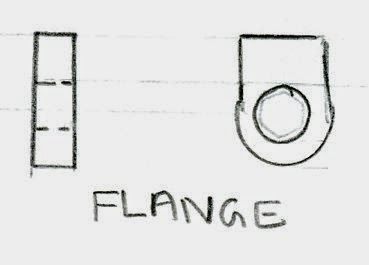 The gunsmith would have welded the two flanges to the end of the clamp ring at A. 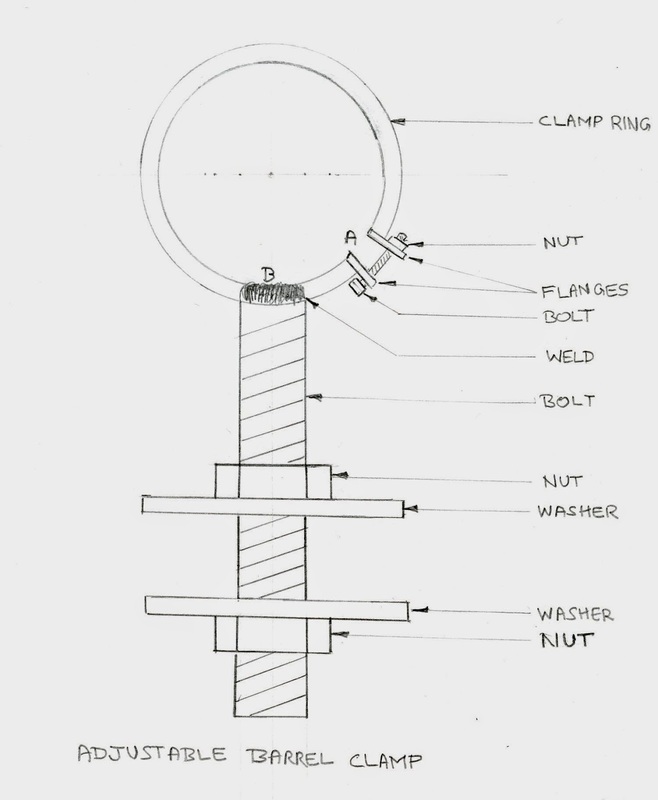 A small bolt is passed through the holes in the two flanges and a nut fastened to the other end. The clamp ring can be then tightened or loosened around the barrel by turning the small nut at A. A larger bolt is welded on to the clamp ring at B. The other end of the larger bolt has two large metal washers and nuts. When attaching the clamp to the machine's bed, the lower nut and washer are unscrewed from the bolt and it is passed through a hole drilled on the bed and then the lower washer and nut are screwed back on to the bolt and both nuts are tightened to the surfaces on either side of the hole, to firmly attach the clamp to the machine bed. This design allows the gunsmith to raise or lower the barrel clamp as needed. The gunsmith would have used two or more of these clamps on the machine's bed to secure the barrel. We will look at how these would have been positioned in a couple of posts. The next part that an ancient gunsmith would have made for this machine is the extension rod. Basically, it is simply a long rod that connects one end of the indexing guide to the end of the rifling cutter. The rod is made of either wood or metal and each end has a metal wood screw attached to it, either by welding or brazing them on. One end of this rod is screwed into the wooden indexing guide and the other end is screwed into the wooden part of the rifling cutter. As you can see, any ancient gunsmith with good woodworking and metalworking skills would have easily been able to make these parts. The only remaining parts of the machine left to study are some wooden parts like the bed, the legs and the support blocks. These are not complicated parts, but are some of the largest parts of the machine. We will study these in the next post and also see how the machine is assembled in the next couple of posts.